The International Garden Centre Association’s 2017 Congress will be hosted by the Canadian Nursery Landscape Association in Niagara Falls, Ont., Sept. 17-22. With a packed program of tours at Niagara region garden centres, as well as educational sessions at the Vineland Research and Innovation Centre, delegates from across the world will experience much more than the average Canadian tourist, and learn from Canada’s leading industry professionals. The itinerary culminates with a Canada 150-themed gala on Sept. 22. For more information, visit www.igcacanada2017.ca. Plantation Products has acquired the Superthrive vitamin solution brand. Founded by Dr. John Thomson in 1938, Superthrive was designed to produce healthier plants. The company remains headquartered in North Hollywood, Calif. Plantation Products is the largest packet seed and seed starting company in North America. The company fills over 180 million seed packets annually and distributes products to over 70,000 retail outlets. Canada’s leading garden retailers and flower, vegetable, cannabis and nursery growers will converge at the Scotia Bank Convention Centre in Niagara Falls, Ont., Oct. 4-5, for the Canadian Greenhouse Conference. With over 350 exhibitors, industry-leading speakers and educational sessions, as well as social and networking events, the CGC is designed to help professionals grow their businesses and connect with suppliers. Details at www.canadiangreenhouseconference.com. The 2017 IFLA, CSLA and AAPQ Congress of the World Design Summit will be held at the Palais des congres in Montréal, Que., Oct. 16-19. Delegates numbering 4,500 from 80 countries, representing six disciplines: Architecture, Landscape Architecture, Graphic Design, Industrial Design, Interior Design and Urban Planning, will gather for an “incubator for re-thinking the mission of the designer and the design process.” Event organizers aim to “break down the silos” between designers in different professions. “This is about more than just the latest trends — it is about your role as a creative leader in society, business, culture and governance,” the organization says. “Designers, architects, planners and landscape architects are gathering for the first time under one roof to share perspectives, foster collaboration and cross-pollinate innovative ideas.” The event will include 100 expert speakers, 108 topics, 30 keynotes and numerous tours. Visit www.worlddesignsummit.com. Stanley Black and Decker has partnered with Habitat for Humanity for a cross country construction initiative. The 34th Jimmy and Rosalynn Carter Work Project is taking place in every province and territory to build 150 homes to commemorate the 150th anniversary of Canada’s Confederation. Former U.S. President and Nobel Peace Prize Laureate Jimmy Carter, and his wife Rosalynn, worked alongside volunteers from July 9 to 14, in Edmonton, Alta. and Winnipeg, Man. An Elmsdale, Ont. man, Mark Lalonde, 38, sustained a fatal injury on Aug. 1 while cutting stone on a landscape jobsite in North Huntsville. According to the Ministry of Labour, inspectors and engineers were dispatched to the scene and made two orders. 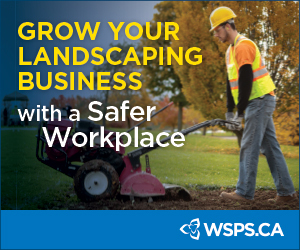 The first order was for the employer, Landscaping Muskoka, to provide documentation and the second order was toward the constructor (homeowners), related to filing documentation. The Ministry of Labour is still investigating. The HortEast Conference and Trade Show is set to take place Nov. 28-29 in Moncton, N.B. Attendees can look forward to meeting suppliers, enjoying social events and learning new skills at professional development opportunities. The event is a cooperative effort between Landscape New Brunswick, Landscape Newfoundland and Labrador, Landscape PEI and Landscape Nova Scotia.Featured speakers include Frank Bourque, an expert in all aspects of hardscape, and business management coach Jacki Hart. More info at www.horteast.com. Markel has reached an agreement to acquire a majority interest in Costa Farms and its related operating companies. Headquartered in Miami, Fla., Costa Farms is the largest producer of ornamental plants in the world. Founded in 1961 by Jose Costa, Costa Farms is a third-generation, family-owned business that stretches over 4,000 acres globally and employs nearly 5,000 people. Along with indoor and bedding plant divisions, Costa Farms operates merchandising services and young-plant production divisions, with operations in South and Central Florida, North Carolina and South Carolina, and abroad in the Dominican Republic and Asia. Markel is a financial holding company serving a variety of niche markets.